Real live Christmas wreaths are taking on new shapes and bringing life to new spaces in creative ways. Sturgill’s offers special shaped Christmas wreaths made from fresh, live evergreens. We can form the Fraser fir and White Pine needles and bough into just about any shape that you can think of including a lovely heart shaped Christmas wreath. Hearts are pretty simple to create because we already have the wire forms to create the wreath from. We offer other shapes as well including candy cane Christmas wreaths, Christmas tree shaped Christmas wreaths, and we’d be happy and honored to help you with any special order request you might have. Our base of operations and wholesale Christmas tree farms are located in Ashe County, North Carolina. Special shaped Christmas wreaths such as the heart shaped Christmas wreaths are wonderful gifts for friends and family that appreciate a fresh live Christmas wreath. These are especially decorative at doctor’s offices, neighborhood mailboxes and other uses. These wreaths can also be fastened to a fence post that has been draped in Fraser fir Christmas garland – which we also sell! We’ve seen heart shaped Christmas wreaths of all types, some that are made with all real materials and some that are comprised of Christmas ornament balls. 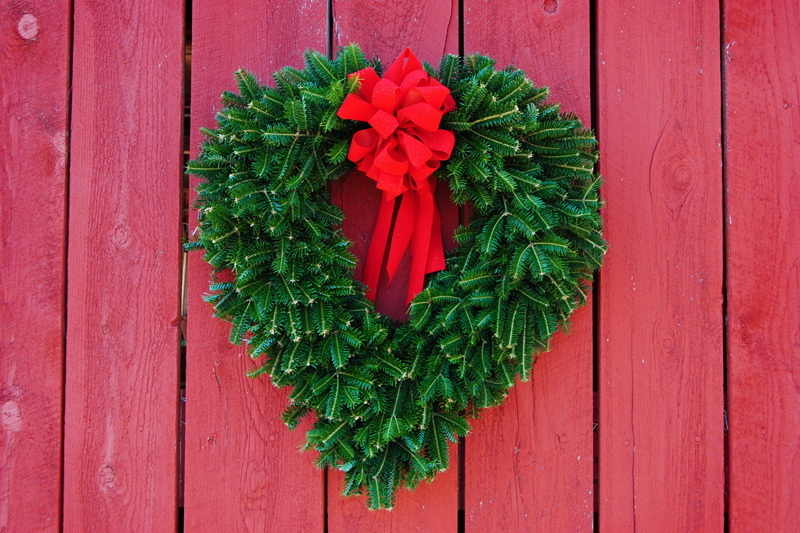 Our heart shaped Christmas wreaths and other special Christmas wreaths are made from all real evergreen foliage grown on our Christmas tree farms in NC, VA and WV. The days of creating wire forms for Christmas wreaths from coat hangers and other wiring are long gone. We use high quality heart shaped wreath forms that are made specifically for wreaths. 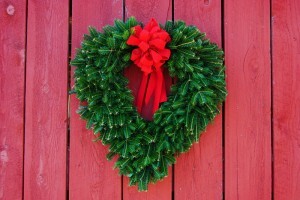 You can embellish your heart shaped Christmas wreath and other special shaped wreaths any way that you choose. The hearts look really great with a ribbon at the bottom point, or just au natural without any fancy adornments. Some people choose to put holly berries strewn throughout the wreath to give it a pop of color but keep things natural. If you put a heart shaped wreath in one of your front windows of your home, you’ll want to buy one for each window in the front to keep things symmetrical.